Baltimore; Boston; Cherry Hill; Greenbelt; Newark; New York City; Philadelphia; Washington, D.C.
BoltBus is an intercity bus common carrier that operates low cost, non-stop and limited-stop, premium level routes in the northeast and western United States and British Columbia, Canada. In the northeast, BoltBus provides service from New York City and Newark to other cities along the Interstate 95 corridor. BoltBus is owned by Greyhound Lines and routes in the northeast are operated in partnership with Peter Pan Bus Lines. On the west coast, BoltBus service is offered in California, Nevada, Oregon, Washington and British Columbia, Canada. Routes on the West Coast are owned and operated by Greyhound without a partner. While BoltBus is owned by Greyhound Lines and uses the company's operating authority, it is run as a distinct business. BoltBus competes with other low cost carriers such as Megabus and Chinatown bus carriers. A BoltBus Prevost X3-45 in New York City. The BoltBus network in the northeast radiates from New York City. Buses depart from three street stops in Manhattan and there are different departure points for different lines. Service is currently available between New York City and Boston's South Station Bus Terminal, Washington, D.C.'s Union Station, Baltimore's Penn Station, the Greenbelt Metro station in Greenbelt, Maryland and Philadelphia from both the 30th Street Station in Center City and the Cherry Hill Mall in the suburb of Cherry Hill, New Jersey. On March 24, 2011, BoltBus expanded its service into Newark. It began providing service from Newark's Penn Station to Baltimore, and Washington, D.C.'s Union Station. On June 23, 2011, BoltBus began providing service from Newark Penn Station to Philadelphia, stopping at John F. Kennedy Blvd and N. 30th St. across the street from the west entrance of the 30th Street Station, and to Boston's South Station. Schedules on this route originate and terminate in Boston and Philadelphia with an intermediary stop in Newark. Beginning August 1, 2012, the main New York stop was moved from West 34th Street and 8th Avenue to West 33rd Street between 11th and 12th Ave., across from the Javits Convention Center, and the newly opened 34th Street – Hudson Yards subway station. On May 17, 2012, BoltBus expanded to the Pacific Northwest, offering service between Seattle and Portland. Service expanded to Vancouver, British Columbia and Bellingham on May 31, 2012 and again on October 3, 2013 with limited service (Thursday through Monday only) to Albany and Eugene. BoltBus expanded into California on October 31, 2013 offering service between Los Angeles and the San Francisco Bay Area. The service originally operated between Los Angeles Union Station, San Jose's Diridon Station and the West Oakland BART Station. A stop at San Francisco's Transbay Terminal was added to the route on December 12, 2013, followed by a stop in Hollywood (near the Hollywood/Vine Metro Rail station) on January 8, 2015. A second route between Los Angeles's Union Station and San Diego was added on November 14, 2013, but was discontinued in January 2014 due to low ridership. BoltBus service was expanded outside of California on December 12, 2013 with a route between Los Angeles Union Station and Las Vegas with a stop in Barstow. When the service first started buses served the Greyhound station at the Plaza Hotel & Casino, but in 2014 the route was modified to serve curbside stops in Downtown Las Vegas (near the Bonneville Transit Center) and along the Las Vegas Strip (near the High Roller Ferris wheel at The Linq). BoltBus #0889, a 2013 Motor Coach Industries D4505 stopped at Pacific Central Station in Vancouver, British Columbia. Unlike parent Greyhound, all tickets sold on BoltBus are for reserved seating and buses are not oversold. On each trip, at least one ticket is sold for $1, with most pre-booked tickets priced in the $10–$20 range, via the yield management model. BoltBus sells the $1 tickets at random within the first few seats sold. The $1 fare is the basis for its slogan “Bolt for a Buck”. Since buses don't operate out of traditional stations with ticket windows, passengers are encouraged to purchase tickets either online or on the phone before heading to the bus stop, but drivers will also accept cash from "walk-up" passengers, if space is available (walk-up tickets typically cost 30% more than online fares). When ticketed, passengers are assigned to a boarding group (S, A, B & C). Passengers who purchased their tickets earlier get a better boarding group assignment, allowing them to board the bus and choose their seats earlier. Passengers who are members of the Bolt Rewards program are always assigned to the A boarding group. Passengers who have special needs are assigned to the S boarding group and are allowed to pre-board before other passengers. 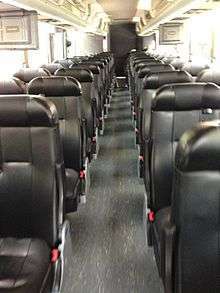 BoltBus interior with leather seats. 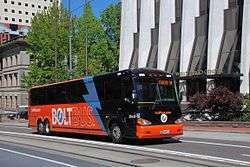 BoltBus routes use Prevost X3-45 and MCI D4505 coaches. All motorcoaches are equipped with wireless internet access and leather seats that have armrests, footrests, seat belts, cup holders and most seats have a pair of 120-volt power outlets. The motorcoaches used on BoltBus have 5 fewer seats than the industry standard, giving passengers additional legroom and eliminating the middle seat from the last row. Prevost X3-45 2008 0800-0832 Powered by Detroit Diesel Series 60 14L. Equipped with Amaya Patriot PT seating. 2009 0833-0837, 0839-0841, 0843-0870 Powered by Detroit Diesel Series 60 14L. Equipped with American Seating Premier. 0838 and 0842 destroyed by fire. Motor Coach Industries D4505 2010 86344 Transferred from Greyhound. 2011 0871-0882, 0884-0885 Owned by Peter Pan Bus Lines. Powered by Detroit Diesel Series 60 14L. 0883 destroyed by fire. 2012 0886 Owned by Motor Coach Industries, replacement unit for 0883. 2014 0887-0901 Powered by Cummins ISX12. Equipped with American Seating Premier. 1 2 3 4 5 6 "BoltBus - FAQ". BoltBus. Retrieved April 19, 2014. ↑ Kinney, Jim (March 11, 2008). "Peter Pan, Greyhound offer new bus service". The Republican. Retrieved June 9, 2008. ↑ "BoltBus - FAQ". Retrieved April 10, 2014. BoltBus is owned by Greyhound Lines, Inc. and is operated in the Northeast region in partnership with Peter Pan Bus Lines, Inc. of Springfield, MA. ↑ "BoltBus - FAQ". Retrieved April 10, 2014. The service on the West Coast of the United States and Canada is exclusively owned and operated by Greyhound Lines, Inc.
↑ Killian, Erin (March 4, 2008). "Boltbus starts from D.C. to New York City service". Washington Business Journal. Archived from the original on March 29, 2008. Retrieved April 15, 2008. ↑ "BoltBus Buy Tickets". BoltBus. Retrieved July 5, 2010. ↑ "Where We Travel". Boltbus. Retrieved June 21, 2011. ↑ "BoltBus to offer $1 fares between Seattle, Portland". ↑ "BoltBus adds a Vancouver, B.C. line from Seattle". ↑ "BoltBus To Expand Oregon Service To Eugene And Albany On Oct. 3". PRNewswire. September 10, 2013. Retrieved November 7, 2013. ↑ "BoltBus To Launch Service In California On Oct. 31". PRNewswire. October 15, 2013. Retrieved October 15, 2013. 1 2 "BoltBus Expands From Los Angeles; Adds Las Vegas, San Francisco Service". PRNewswire. December 10, 2013. Retrieved December 12, 2013. ↑ "BoltBus Continues California Expansion, Adds San Diego Service". PRNewswire. November 6, 2013. Retrieved November 7, 2013. ↑ "The Canadian Press: Greyhound's BoltBus offers cheap curbside service in the United States". canadianpress.google.com. May 2, 2008. Retrieved May 14, 2008. ↑ Anita Hamilton (June 6, 2008). "Beating $4 Gas with a $1 Bus". Time, Inc. Retrieved June 8, 2008. ↑ "CPTDB Wiki - BoltBus". Wikimedia Commons has media related to BoltBus.